Each guest room at the Ocean Pacific Lodge is designed with guest comfort in mind. Our spacious rooms range from 275 to 420 square feet, with styles ranging from king, queen, double queen, and multi-room accommodations that include two king beds. Each guest room is equipped with amenities like complimentary WiFi, personal climate control, refrigerators and microwaves, coffee makers, an iron and ironing board, a desk and telephone, and flat-screen TV's with premium cable channels. Each room is fitted with a private en-suite bathroom that includes soft towels, a hair dryer, and complimentary signature toiletries. We have a 48-Hour Cancellation Policy. If you wish to cancel or modify a reservation, you must do so by 3 PM 48-hours or 2 days prior to your arrival date. If you cancel or modify post the expiration of the Cancellation Period or you fail to show up, a no-show charge will be levied on your credit card for one full night plus tax. Non-refundable reservations cannot be canceled or modified - total reservation amount will be charged in case of cancellation or no-show. Note: A $250 refundable security deposit will be authorized on the guest's credit or debit card upon arrival. Please be aware that the release of the security deposit may take 3-5 business days after guest's departure date due to individual bank policies. 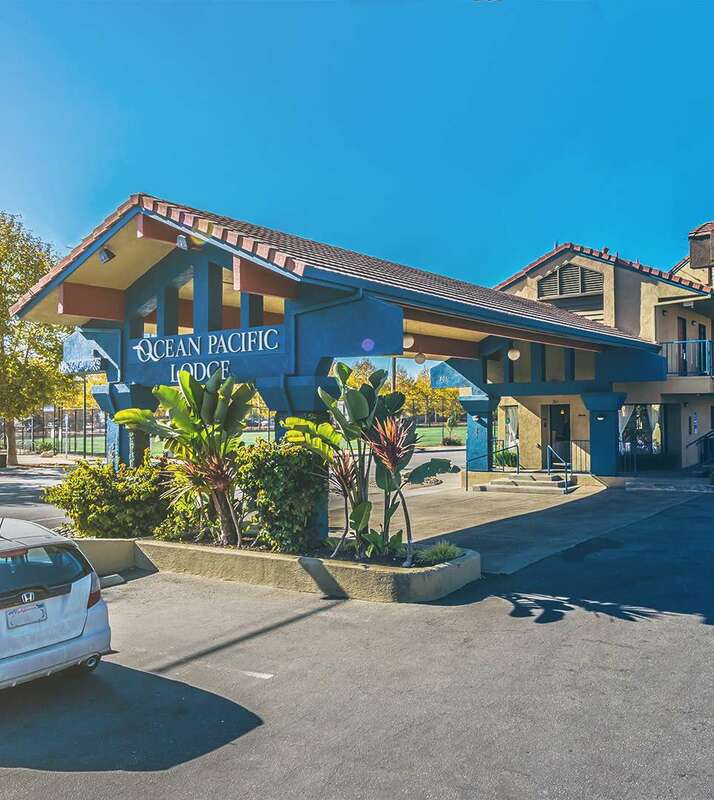 The Ocean Pacific Lodge is located at 301 Pacific Avenue in Santa Cruz, California. Our location provides guests with easy access to Cabrillo Highway 1. We are 43-minutes to the San José International Airport, 53-minutes to the Monterey Regional Airport, and just over one hour to the San Francisco International Airport, and the Oakland International Airport. The Ocean Pacific Lodge is proud to provide guests with a 100% smoke-free pet-friendly hotel. Because our focus is on guest comfort, we offer complimentary WiFi, complimentary self-parking, a 24-hour front desk, a business center, and multilingual staff. There are vending machines on-site with a variety of snacks and beverages. Additional convenient services include baggage storage and premium cable channels. Up to two children 17 and younger stay free of charge when staying with a parent or guardian and using existing beds. Additional adults are charged $20 per person, per night when using existing beds. The maximum number of extra beds or cribs per room is one. Any type of crib or extra bed is upon request and must be confirmed by management. Additional fees are not automatically calculated in the total and must be paid separately during your stay. ADA Defined Service Animals are welcome at our hotel at no charge. Our hotel is also pet-friendly. Pets are welcome for an additional fee of $30 per pet, per night. Pets must not be left unattended in the guest room. This property is privately owned, and the management reserves the right to refuse service to anyone and will not be responsible for accidents or injury, to guests or for loss of money, jewelry or valuables of any kind including damage to vehicle and theft of property. Once checked in, no cancellations. All linens are inventoried: missing or damaged linens will be charged. Any damages to hotel property will be charged an additional fee upon assessment. Any damages to hotel property will be charged an additional fee upon assessment. This is a NON-SMOKING facility. Guest acknowledges that smoking is not allowed in a guest room or within hotel facility. If anyone in guest's party smokes in the guest room, guest hereby expressly authorizes hotel management to charge credit card the amount to reimburse the property for the additional cost of cleaning guest room. If your reservation has been paid in advance or you elect to pay by cash, a security deposit via credit card will be required upon check-in and will be charged in the event that damages outlined herein occur. The hotel takes a credit pre-authorization but does not accept cash deposits.